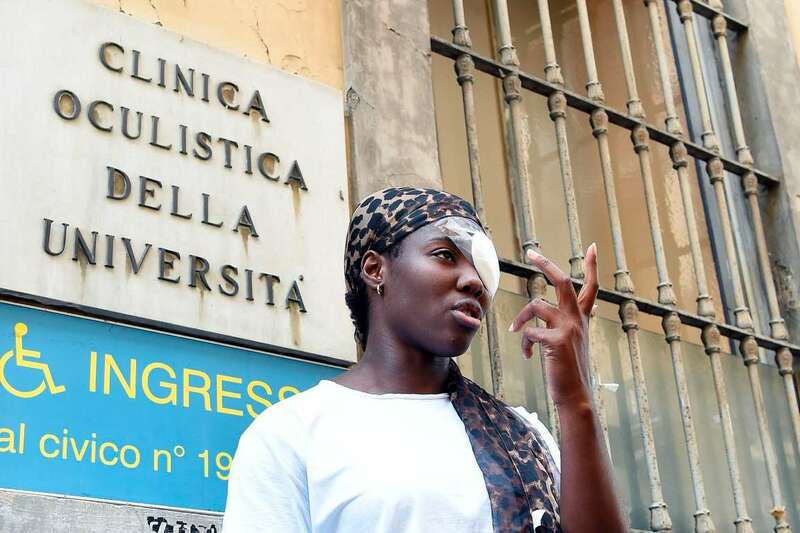 The Italian discus thrower Daisy Osakue addressed the media outside the hospital in Turin on Monday after she was hit in the face by an egg hurled from a car. Daisy Osakue grabbed her pink sneakers from the terrace and packed them in a suitcase embossed with the Italian flag. All around her family’s apartment, newspaper articles, old photos and posters hailed her success in track and field. Dozens of medals hung from pictures of her family celebrating in traditional Nigerian dress. “Just need to get my medicine,” she said on Thursday morning, her left eye tearing and bloodshot, as she grabbed prescription drugs and eye patches. They sat on a coffee table next to white flowers a neighbor had dropped off in solidarity. Before this week, Ms. Osakue, 22, had a modicum of renown for throwing the discus farther than any other Italian woman ever in her age group. But since Sunday, when young men outside her apartment complex threw an egg that cut her cornea, she has become the bandaged face of Italy’s explosive debate over whether the country is becoming more racist under its new populist, anti-immigrant government or whether politically motivated liberals and a sensationalist media are unfairly sounding the alarm. What is clear is that Italy is on edge. [post_ads]The country’s head of state, President Sergio Mattarella, who clashed with the populist government over his reservations about its formation, is giving speeches warning that migrants risk entrapment in a “modern slavery” and is urging Italians not to “look away.” Catholic newspapers are sounding the alarm over the country’s xenophobic climate. The left is issuing ominous warnings. There’s a lot of violence to point to. This summer, a Calabrian shot and killed a migrant who took sheets of metal from an abandoned warehouse, and Italians in the cities of Caserta, Naples, Forlì and Latina have shot migrants with air guns. In Rome, a 13-month-old Roma girl was hit by a bullet on her terrace, and a man in Vicenza shot a migrant, claiming he was trying to kill a pigeon. This week, men in Aprilia killed a Moroccan they had suspected of trying to steal a car. On Thursday night, two men on a motor scooter in Naples shot a Senegalese vendor in the leg. “All the other attacks were like a moment of anger, maybe mine as well,” said Ms. Osakue, an ebullient, photogenic and gregarious polyglot with dreams of winning an Olympic medal for Italy, the only country she has ever known. A student of criminal justice at Angelo State University in Texas, where she also trains (a “Go Rams” sticker is stuck on her parents’ radiator), Ms. Osakue, who is black, wondered if Italy was descending into a state governed by a fear of immigrants. For advocates of migrants, the major concern is the League, the anti-immigrant party led by Matteo Salvini. Its governing partner, the anti-establishment Five Star Movement, has mostly closed ranks on the migration issue, and dismissed the recent incidents as a conspiracy by the establishment media against the government. The egg attack happened on Sunday night, as she returned from a training camp to visit her godmother, whose child has been sick in the hospital. As she approached a small bridge often trafficked by African prostitutes, she noticed a car waiting. Moments later, the Fiat Doblò sped toward her and she felt a burning sensation in her left eye. She said she believed the men in the car thought they had an easy target in a black woman or a prostitute who wouldn’t be able to say anything. “Unfortunately for those two guys, I was Daisy,” she said. After the assault, Ms. Osakue leveled accusations of racism on television and her bandaged left eye was emblazoned across the cover of the national newspapers. She seemed to mean something to everyone. The left hoisted her up as their champion. “Her words are our words,” Maurizio Martina, the leader of the Democratic Party, said in an interview. After the phone conversation, Mr. Conte said Ms. Osakue had assured him she did not consider the attack racist. That assertion soon played into the hands of populists, who have characterized the concerns about racism as politically motivated media hysteria. Late Thursday, the authorities identified the assailants as local men, including a 19-year-old who had confessed to throwing eggs at passers-by, regardless of skin color, on at least seven occasions over recent months. But the confession gave Mr. Salvini, the powerful interior minister, fresh ammunition. On Friday he wrote on Twitter: “I’m waiting for apologies over the Daisy Osakue case. They sounded a racist alarm and instead it was three idiots.” He added with glee that “one was the son” of a local Democratic Party official. Followers of Mr. Salvini, who argue that illegal immigration and crime — not racism — are Italy’s major problems, found additional talking points on Friday. Conservative news outlets reported that in the 2000s, Ms. Osakue’s father, Iredia Osakue, had been arrested multiple times for drug dealing and promoting prostitution. In 2007, he was sentenced to five years in jail for those crimes and for heading up a violent Nigerian mafia. Her mother had also been arrested, on prostitution charges in 2002, according to a spokesman for the Carabinieri of Turin, who confirmed the other charges. “No comment,” the father said when reached on the phone Friday evening. Ms. Osakue said she had found the mockery of her as a “poor little black girl” that erupted after her injury to be unfair, and disputed the accusation that she had milked the injury for notoriety. “I’d have sought attention in another way, I do track,” she said. She loaded her bag in a cab and rode to the train station on her way to meet with officials in Rome before a European championship competition in Berlin next week. On the way, she said she still had some concerns about where Mr. Salvini was taking her country. Mr. Salvini has a formidable talent for exploiting a sense of victimization, for building a nationalist base and baiting liberals. “So many enemies, so much honor,” he wrote in an apparent ode to Mussolini’s phrase “Many enemies, much honor” on the Fascist dictator’s birthday, July 29. [post_ads]In June, Mr. Salvini engaged in a spat with Italy’s most famous black soccer star, Mario Balotelli, who recalled having endured years of racism before and after he gained citizenship as an adult. Italian citizenship is based on blood and can only be earned by the children of immigrants who reach age 18 after living in the country since birth. Mr. Salvini’s opposition to the previous government’s proposal to ease the citizenship requirements for children of immigrants born in Italy was a key campaign issue for him. Ms. Osakue, who was born, raised and educated in Turin, became a citizen under the existing rules. She and her two younger siblings, who are also talented athletes, took the failure of the previous government’s citizenship proposal hard. Ms. Osakue said she was teased through childhood, called a “prostitute or monkey” and often mistaken for an immigrant — until she responded in her flawless, native tongue. Despite all that, she said, her inability to represent Italy after having won a hurdles competition for minors stung because she was not yet a citizen back then. When the opportunity to study and train in Texas presented itself in 2017, she said her parents and coaches had made sure she jumped at it.